The Chemical Daily is Japanese leading chemical-industry newspaper. In 2011, we celebrated 75 years of effectively providing the chemical community with the relevant news and information necessary to push ahead with business growth. With a strong daily readership, The Chemical Daily is one of the longest established and most valued sources of chemical-industry information in Japan and Asia. For many years, we have played a key role as a high-quality opinion leader and, in the months and years ahead, we intend to answer the increasingly diversified and sophisticated needs of our readers and continue to provide accurate, in-depth information on life sciences, electronics and other high-tech fields, as well as chemical operations; Asian and world news, keeping in pace with the era of globalization; and reports on the environmental sector, which calls for a global response. In particular, against the backdrop of heightening interest in environmental issues on a global scale, our Environment page showcases timely information on the activities of industry, government and academia, as well as the latest R&D developments. Moreover, we have strengthened our overseas reporting framework while at the same time fostering cooperation with leading overseas media to reflect live local information on our pages. In addition, we provide accurate and dependable market price information, and price listings for a wide variety of chemical products. Launched in 2016, japanchemicaldaily.com is the online English-language edition of Kagaku Kogyo Nippo. It is the only English-language information source dedicated to reporting on Japan’s chemical industry. Japanchemicaldaily.com is published in partnership with Japan Industry News. The scope of The Chemical Daily Co., Ltd. is not restricted to newspaper publication. To enable rapid response to the changing needs of our readers and to current issues such as global environmental concerns, we have extended our resource network to encompass companies, the government and academic conferences, and we continue to publish chemical-industry-related specialized books and educational volumes with the goal of providing information that is universally useful. We are also pushing ahead with the digitization of a variety of books, and the release of CD-ROMs. This handbook covers the characteristics, methods of production, uses, manufacturers, prices and legal regulations of chemical products, which have become more and more diversified in recent years. In the 53 years since its inaugural issue, Kagaku Keizai has been the Japanese chemical industry’s only monthly specialist journal and, as such, has played an important role as an indicator for Japan’s chemical industry. Recently Kagaku Keizai has featured a number of unique articles that deal with such wide-ranging topics as information on China, environmental issues, and IT. It is attracting more attention than ever. In addition to the regular monthly issues, three extra editions are published every year: White Paper on the World Chemical Industry; White Paper on Japan’s Chemical Industry; and White Paper on Asia’s Chemical Industry. These also are well received by our readers. At seminars and symposiums, we invite specialists, government officials and academic experts from within Japan and overseas to lecture on the hottest topics such as management issues, environmental regulations, and safety controls for chemical substances. We also hold exhibitions as venues for direct interaction between participants along with the exchange of products and information, thereby opening the door to business opportunities. 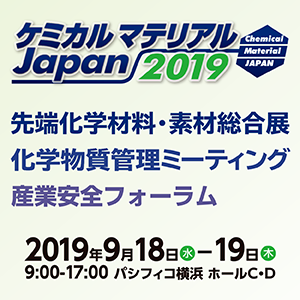 Since 2002 in conjunction with the UBM Group, we have organized CPhI Japan (Convention of Pharmaceutical Ingredients Japan) in Tokyo, gathering together a large number of exhibitors and visitors from throughout the world, contributing to the steady expansion of the pharmaceutical and related industries. In addition to the world’s largest chemical engineering exhibition ACHEMA, held by Germany’s Society for Chemical Engineering and Biotechnology (DECHEMA), we regularly send representatives to the European and US chemical industries, and to the Southeast Asian chemical industry. Each party calls in on the leading companies and government offices in the areas they visit, exchanging information and deepening friendly relations. Asahi Glass Co., Ltd. / Ube Industries, Ltd. / Showa Denko K.K. / Sumitomo Chemical Company, Limited / Denka Company Limited / Mitsui Chemicals, Inc. / Mitsubishi Chemical Corporation / Tosoh Corporation / Asahi Kasei Corporation / KANEKA CORPORATION / Tokuyama Corporation / NIPPON SHOKUBAI CO., LTD. / MITSUBISHI GAS CHEMICAL COMPANY, INC. / JSR Corporation / JXTG Holdings, Inc. / Nissan Chemical Industries, Ltd. / NIPPON CHEMICAL INDUSTRIAL CO.,LTD. / NIPPON STEEL & SUMIKIN CHEMICAL CO., LTD. / SEKISUI CHEMICAL CO.,LTD. / Daicel Corporation / KUREHA CORPORATION / Shin-Etsu Chemical Co., Ltd. / Central Glass Co., Ltd. / Nippon Soda Co., Ltd. / Hodogaya Chemical Co.,Ltd. / JNC CORPORATION / ITOCHU Corporation / Marubeni Corporation / MITSUI & CO., LTD. / Mitsubishi Corporation / Sumitomo Corporation and other major chemical company, pharmaceutical company, engineering company, specialized trading company, etc. Chemicaldaily Regulatory Info-Center Co., Ltd. Since the year following its founding in 1936, The Chemical Daily Co., Ltd. headquartered in Tokyo, has been publishing Kagaku Kogyo Nippo, The Chemical Daily, a trade newspaper comprehensively covering the chemical industry, from basic chemicals to specialty chemicals. It recently extended its reach to chemical-related fields such as electronic materials, automotive materials and water treatment, all of which are Japanese fortes and regarded as cutting-edge industries to take us into the next generation. Subscribers include chemical companies, financial/insurance companies and trading houses, as well as government departments. We established overseas branches in Singapore in 2000 and Shanghai in 2005 to expand our news coverage of emerging chemical industries in Asian countries. In addition, we have been sending our reporters to the US and EU on a regular basis every year to improve the flow of information to our readers. In 1960 we inaugurated Japan Chemical Week, an English-language weekly newspaper as a sister publication of The Chemical Daily, distributing it worldwide besides Japan. It is the only English-language periodical published in Japan that is dedicated to the provision of news on the chemical industry. 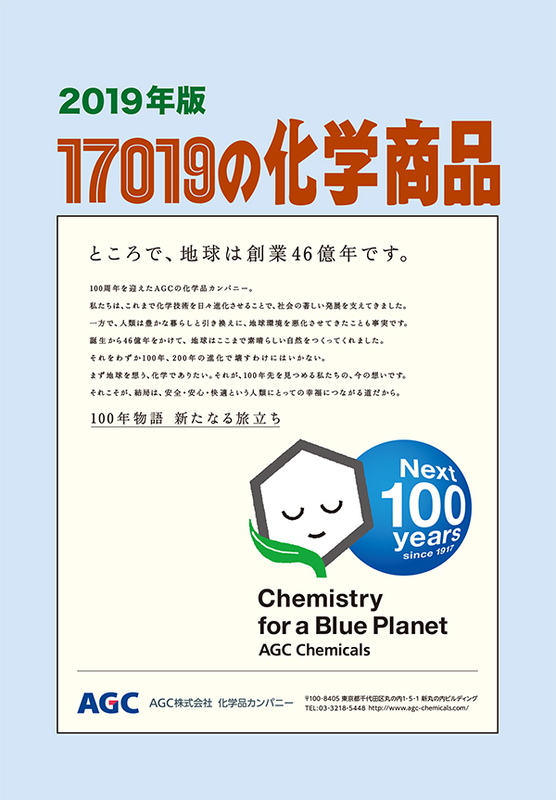 Copyright (C) 2019 The Chemical Daily Co., Ltd.